This boat is a 20 ft. long all wood vessel that is designed to be used both on lakes and in the Gulf. The wood is Honduran Mahogany. Boat has been stored inside an RV garage out of the elements. The bottom of the boat was redone-blocked and painted-in July, 1997 by Cedar Mills Marina on Lake Texoma. The boat is designed for two outboard motors. 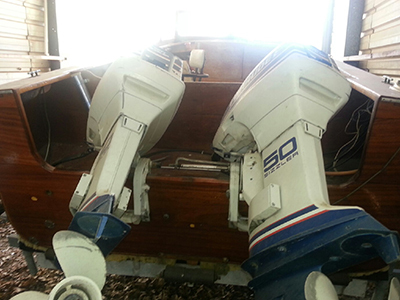 The outboard motors on the boat are 1974 Evinrude 50HP. 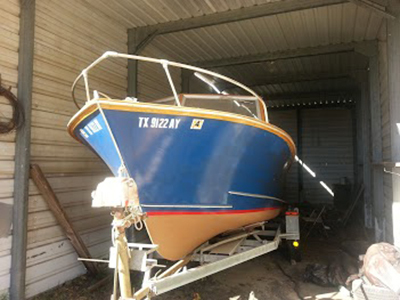 Interior of boat is intact but needs refinishing. 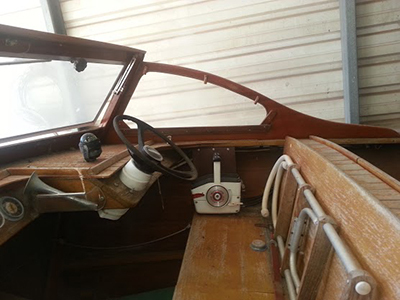 The canvas is missing but the bimini frame is also intact and included. There is a trailer as well. Registration for the boat, trailer, and two motors is current.